& Giant Jamboree sneak preview! We know you are hard at work on your iGEM projects as the season is in full swing. Remember that part of what makes participating in iGEM such a great experience is this strong community. We encourage you to take a moment and connect with other iGEM 2016 teams as well as the broader iGEM community. Here are 10 ways you can stay connected! Join us at the Giant Jamboree! All iGEM 2016 participants and the global synthetic biology community are invited to attend this year's largest synthetic biology event. Attention: iGEM 2016 team participants must register by August 31, 11:59PM EDT. If your team does not register and pay by the August 31 deadline, we will not know to reserve a presentation time and poster slot for your team. Team presentations - Poster Sessions - Workshops - Career Fair - Panel Discussions - Social Events - and much more! 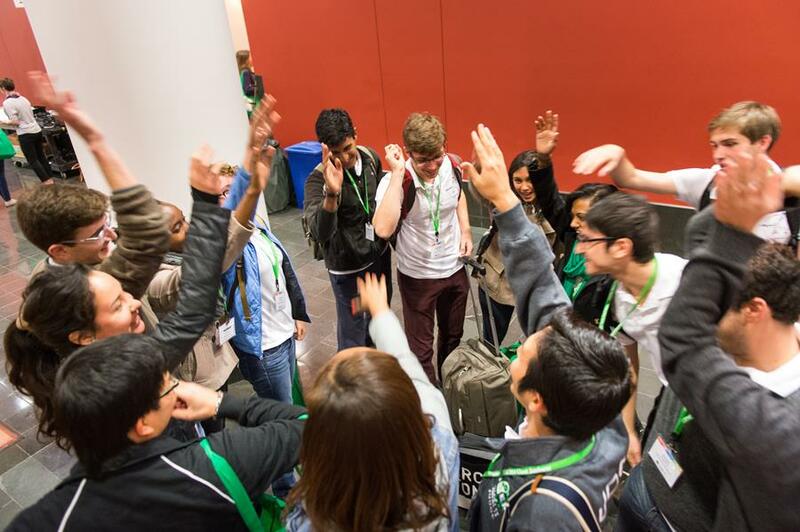 iGEM is more than a competition, it is a community. And the strength of the iGEM community is in its members' passion, knowledge and commitment. This is on full display at the Giant Jamboree. Why not use this opportunity to meet other like-minded people to share ideas and form connections, collaborations and friendships. with other teams at the Jamboree? Share your ideas with us by emailing us at hq AT igem DOT org with 'GJ Team Interaction IDEAS' in the subject line. We are here to help! All iGEM teams have been assigned an iGEM staff member as a point of contact. Email or call - we are happy to hear from you and help you navigate through the iGEM competition. iGEM 2016 participants - look for an email from us in the next few weeks. Only available to iGEM 2016 participants! 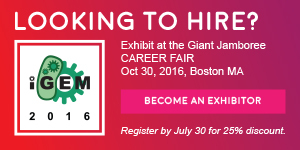 Make sure to come prepared with your resume and visit the event page (http://2016.igem.org/Giant_Jamboree) often for an updated list of exhibitors. In an effort to bring you a wide variety of opportunities, we are advertising to both companies and universities to exhibit at the career fair. Come prepared to impress! Do you know of anyone interested in iGEM that is not a current participant? 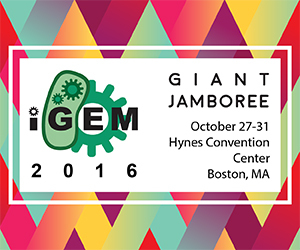 Invite them to experience iGEM through volunteering for the Giant Jamboree. Apply before July 22nd to become a volunteer. This opportunity is open to past iGEM participants and other non-team members only. The Community Bulletin lets you see what members of the iGEM and greater synthetic biology community are talking about. Check out team collaboration opportunities, synbio events, and more by visiting the Community Bulletin page. Past and present iGEM participants are invited to post on our bulletin page. Have community news? Email us at hq AT igem DOT org with "Community Post" in the subject line. An iGEM Meet-up is the ideal gathering place to meet with iGEMers in your area to share stories, show progress and give/get feedback. You may even see an iGEM HQ staff member there! For a complete list of meet-ups visit our Meet-up page. Know of an event not listed on our page? Tell us about it and we'll help promote it. Follow us on Facebook (https://www.facebook.com/iGEMCompetition/), join the iGEM group (https://www.facebook.com/groups/igemmers/) and keep an eye on @iGEM (and contribute to) #iGEM2016 on Twitter. See 'iGEM News' on 2016.igem.org for lastest news, program updates and announcements. By visiting this page often, you'll always be informed! For the latest program updates and announcements visit the Giant Jamboree event page. Check back often and stay informed!